Are you looking for a great selection of uesd trucks for sale near Indianapolis? The only place you need to go is the Acra Automotive Group car dealership near you. Acra Automotive Group has four car dealerships conveniently located throughout the Indianapolis area. We have an outstanding selection of used trucks for sale because we know that not everyone has the same needs when it comes to their truck. That is why we offer such a large variety of used trucks for sale at Acra Automotive Group. We have everything from the Chevy Colorado to the Toyota Tundra at Acra. You will find used 4x4 trucks for sale and used diesel trucks for sale, as well. We have just what you are looking for at Acra Automotive Group. We are proud to provide the Columbus, Franklin, Greensburg, Hope, Indianapolis, and Shelbyville areas with the best buying experience possible at the Acra Automotive Group. Acra Auto Group is here for all your automotive needs. We are here to guide you every step of the way. From helping you choose the right used truck for sale that fits your lifestyle to financing your used truck to servicing your used truck, you can count on at Acra Automotive Group. When you want a truck that owns, towing, trailering ability and payload capacity, check out a used 4x4 truck. The best place to find a used 4x4 truck for sale is at the Acra Automotive Group car dealerships in Columbus, Greensburg, and Shelbyville IN. 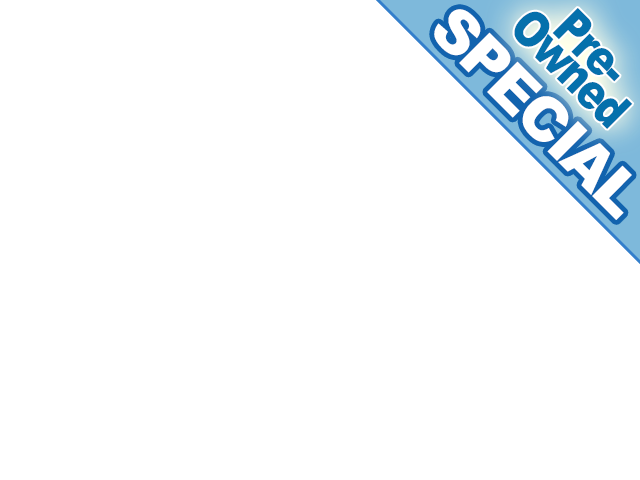 Did you know that you could get a fantastic deal on a used 4x4 truck for sale with almost any budget? With our selection of used 4x4 trucks for sale in Columbus, Indiana, you can secure a used 4x4 truck for sale at a great price from Acra Automotive Group. Are hard working used diesel trucks for sale in Indiana going to be what interests you in your next truck? Then you should check out the used diesel trucks for sale in Indiana at Acra Automotive Group. Used diesel trucks for sale in Indiana are known for getting better gas mileage, better horsepower and torque, better engine longevity and better reliability. So, how can you go wrong when choosing a diesel truck from Acra Automotive Group. With a full selection of used diesel trucks for sale in Indiana and a variety of options to choose from, you are bound to find a used diesel truck that best suits your needs. Our knowledgeable sales team members are ready to answer any questions you may have about our used diesel trucks for sale in Indiana. Speak with an experienced sales team member about all the great benefits of owning a used diesel truck from Acra Automotive Group today. Are you searching for a used truck for sale that offers both a diesel engine and four-wheel drive? Then check out the used Ram 2500 Big Horn 4x4 truck for sale at Acra. 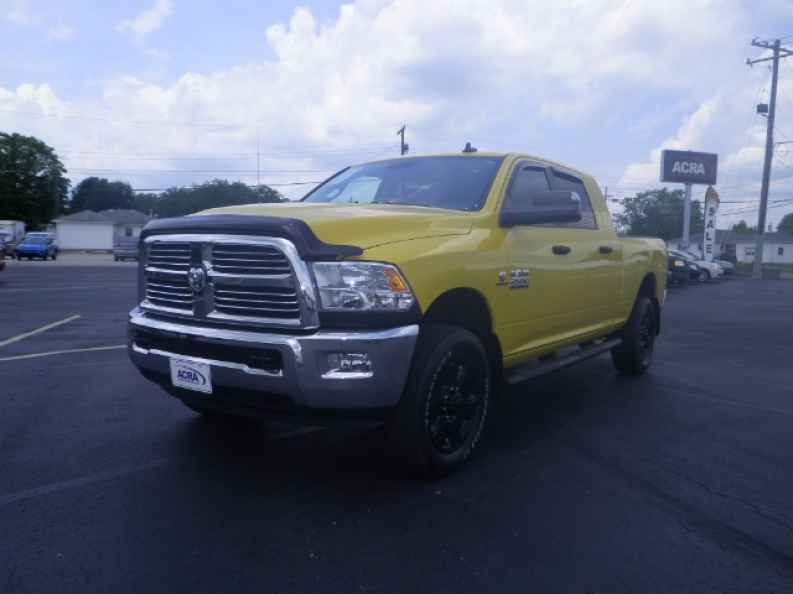 This used Ram diesel 4x4 truck for sale is sure to turn some heads with its bright yellow paint and black rims and step tubes. A powerful 6.7-liter V6 diesel engine that boasts an incredible 383 horsepower is what you will find on this used Ram diesel 4x4 truck for sale at Acra. 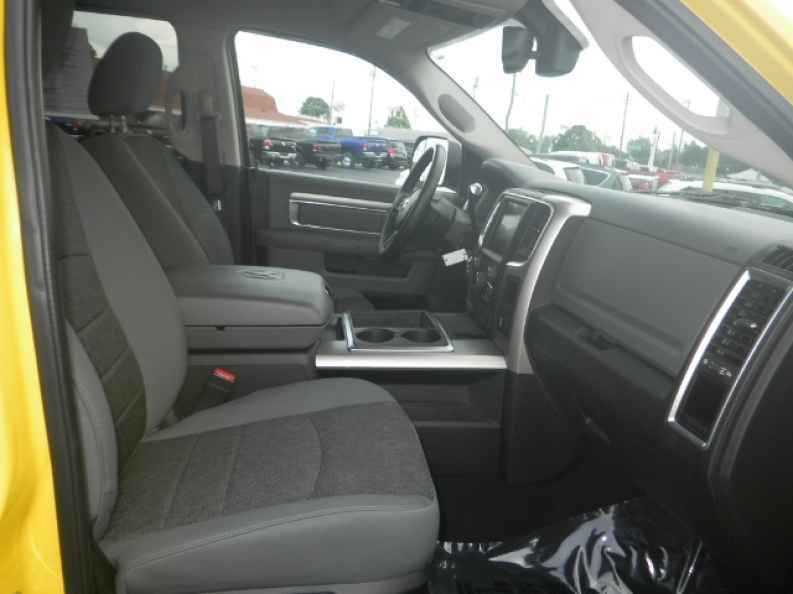 This used Ram diesel 4x4 truck for sale also features heated seats for the front passengers, steering wheel contols, and many standard safety features. Come to Acra Automotive Group to test drive this amazing used Ram diesel 4x4 truck for sale today. Are you looking to upgrade your current vehicle and use it as a trade at Acra Automotive Group? When it comes time to buy your next truck, it is always a very good idea to trade in your old vehicle. It is not just a way to not have to worry about selling your vehicle yourself; it can help lower your monthly payments. We take in all types of trades at Acra Automotive Group! Getting an estimate of what your current vehicle is worth makes it easier to plan for what kind of used truck for sale you can afford, too. So, when you pick out your next used truck for sale that is perfect for you, have your sales team professional get your vehicle appraised. Let us help you get one step closer to driving home in your next truck from Acra Automotive Group today. So, if you are looking for a dealership that offers an excellent selection of used trucks for sale in Indiana and deals that match, come to Acra Automotive Group. Whether you are looking for a used 4x4 trucks for sale, used diesel trucks for sale or one of our many other used trucks for sale in Indiana, and we have the used truck you want at Acra Automotive Group. We welcome you to view our online inventory of used trucks for sale in Indiana that you can quickly search by make, model, and price. If you are in the area, see them in person at Acra Automotive Group. You can find the Acra Automotive Group car dealerships located at Acra Pre-Owned Superstore located at 2820 North National Road in Columbus, IN 47201; Acra Pre-Owned Superstore located at 1200 East State Road 44 in Shelbyville, IN 46176; Acra Chrysler Dodge Ram located at 1407 North Lincoln Street in Greensburg, IN 47240; and Acra BuyRight located at 920 North Michigan Avenue in Greensburg, IN 47240.